I’ve been using the pre-release versions of Android N since Google’s first developer preview back in March and all the way through the most recent update put out last week (which is available to anyone with an eligible device, though be warned that it isn’t entirely stable). While the software is still in flux and its elements aren’t guaranteed to remain unchanged, we’ve seen enough at this point to get a pretty good idea of what’s in the works. Here’s a tour of the most significant new elements in Android N as of now — and why they all matter. The marquee feature in Android N is without a doubt its new multi-window mode. The feature makes it possible to split a device’s display in half and view two apps onscreen at the same time. The new multi-window mode makes it possible to split a device’s display in half and view two apps onscreen at the same time. Sound familiar? It should: Manufacturers like Samsung have been adding that ability into their Android devices for quite a while now. Android N, however, marks the first time the function is being offered as a native part of the actual operating system — which means it’s the first time it’ll be available on all Android devices, regardless of who makes them, and the first time developers will be able to optimize their apps to work consistently well with the feature across the entire platform. 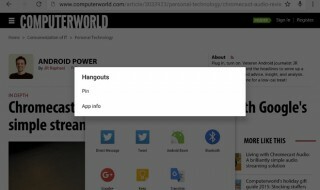 Taking advantage of multi-window mode on Android N is quite easy: While using any app, you simply press and hold the system Overview key (typically the square-shaped icon next to the Back and Home icons). That shrinks the app down to half of the screen and brings up cards showing your most recently used apps in the other half. All you do then is select the second app you want from the stack of cards, and ta-da: You’ve got two apps running simultaneously on your display. Alternatively, you can fire up multi-window mode by tapping the Overview key once from anywhere in the system — then touching and holding any card in your recently used apps list and dragging it onto the top part of the screen. You can even arrange two Chrome tabs together, if you want. If you’re anything like me, multi-window mode isn’t something you’ll use all the time — but it is something that can come in handy once in a while, like when you want to glance at an email while editing a document or send a text message while continuing to watch a video on YouTube. Something I’ve been enjoying even more than multi-window mode is the new fast app-switching feature available in Android N. You can think of it as Alt-Tab for Android: When you want to jump back and forth between two apps in a snap, you just double-tap the Overview key — and almost instantly, Android zaps you back to the last app you had open. It makes for a much more efficient way of hopping between processes. Once you get used to it, you’ll wonder how you ever got along before. For times when hopping alone won’t suffice, you’ll still want to use Android’s full Overview interface — and with the N release, that part of the platform gets some much-needed polish. As of the most recent preview, Android N limits the number of items in the Overview list, so that you see only cards from the last seven apps you’ve had open. That’s a huge improvement from the previous mess of a setup, where dozens upon dozens of cards would stack up and make the function more overwhelming than useful. In addition to the inherently decluttered view, Android N offers a new command to clear away all the cards in the Overview list and start fresh. All in all, it’s a much improved user experience that makes getting around Android even easier. 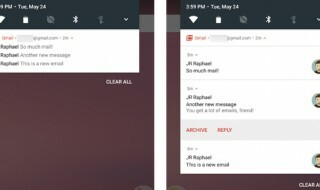 Android’s notifications are getting better thanks to a refined interface introduced in Android N. Multiple alerts from a single app are now bundled together into a single expandable card — so if, for instance, you received three new messages in Gmail, you’ll see a single card in your notification panel with an overview of that info. Tapping the card will then fan it out into individual mini-cards with more detailed info on each message, and tapping any one of those mini-cards will expand it and allow you to perform message-specific actions like archiving. Left: The initial “bundled” view of multiple notifications from a single app. Right: The fully expanded view with detailed message info and actions. Android N also makes it possible to reply to a notification right from the notification panel — something certain apps allowed via workarounds in the past but that can now be accomplished far more easily and consistently. 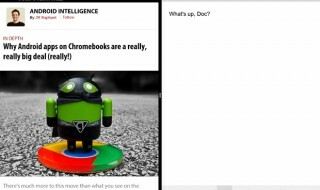 With Hangouts, for example, tapping the Reply button within a notification causes the notification to expand downward and a text window to appear inside it. You can then type your response and send it without ever switching apps or stopping whatever else you were doing — a cleverly implemented convenience that quickly becomes invaluable. Speaking of accomplishing things without interruptions, Android’s Quick Settings feature gets some significant new polish with the N release. 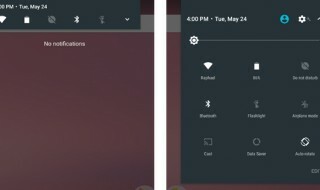 First of all, a scaled-down version of your Quick Settings now appears when you first pull down the notification panel — a major improvement from previous versions of Android, which utilized nearly the same amount of space to display only the time, date and a few function-free icons. With Android N, that area holds six functional shortcuts for tasks like toggling your device’s Wi-Fi, Bluetooth or do-not-disturb mode. When you swipe down on the panel a second time (or swipe down once with two fingers, if you prefer), it expands to show a series of tiles that give you access to a broader and more versatile range of commonly used functions. These tiles allow you to perform more intricate actions — like connecting to a specific Wi-Fi network or viewing detailed battery usage info — without ever exiting the Quick Settings pull-down. The tiles are now customizable, too: You can add and remove items and place them in any order you like. And whichever tiles you place into the first five spots appear in the scaled-down version of Quick Settings described above — an extremely useful bit of personalization potential. 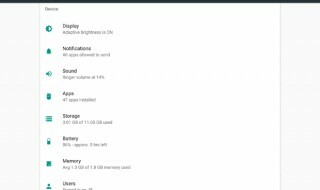 Android’s full system settings also get a fresh coat of paint in Android N. It’s nothing transformational, but you’ll notice some subtle improvements — such as a new Suggestions section at the top that tries to predict what you’re looking for and make it easy to find, or the fact that the main settings screen now shows extra nuggets of info under each primary option (like your current ringer volume level under the Sound heading, for instance, or how much of your device’s storage is available under Storage). Android’s full system settings also get a fresh coat of paint. You’ll find a few newly added options within the settings, too, for things like setting separate wallpaper for your home and lock screens, and the ability to adjust your device’s display size and make everything bigger. Google has also attempted to make getting around the system settings simpler by adding a side-loading menu that lets you move directly from one section to another. Hey, anything that can save a second or two — right? A seemingly teensy change that’s become one of my favorite Android N features is the ability to customize the system-wide Share menu. Google’s used a lot of different methods for sorting that menu over the years, but for some reason, my favorite sharing destinations always seem to end up buried in the middle of the list and frustratingly hard to find. With Android N, you can long-press any icon in the Share list and pin it to the top. You can pin any number of apps you want, and they’ll appear in the order you pinned them. Sometimes, it’s the smallest things that make the biggest difference. Unlimited data isn’t a reality for many smartphone owners these days, and Android N has a little something for the gigabyte-pinchers among us: a new Data Saver mode that senses when you’re on a metered network and puts the brakes on your mobile data usage. Data Saver works in two ways: First, it blocks background data usage so your apps won’t move any more bytes than is absolutely necessary. (You can manually whitelist certain apps as exceptions if you want.) And second, it tells apps to limit the amount of data use in the foreground whenever possible. In addition to all the front-facing features, Android N includes the usual host of under-the-hood improvements we hear about with practically every OS upgrade. This latest version of Android promises to provide faster and more effective performance, better battery life and other similar stuff. It hasn’t been anything I’ve noticed in regular day-to-day use, but your mileage may vary (and some of these areas may be more apparent once a final release arrives). Android N also introduces support for a new VR Mode that’ll provide a system-level platform for phone-connected virtual reality headsets. Devices will have to meet specific hardware requirements in order to be certified as “VR ready,” though, and Google’s Nexus 6P is the only phone that’s been certified thus far — so odds are, you won’t be seeing the effects of this on your current device anytime soon. 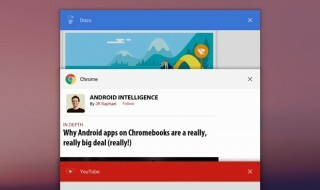 On the enterprise front, meanwhile, Google’s Android for Work program gains a handful of new features with the N release, including quick device-provisioning via QR code scanning, an optional security challenge to add an extra safeguard to work-related apps, a simple toggle for users to enable and disable a device’s work mode and an always-on VPN requirement. implications for the future of Google’s platforms (despite what some myopic analysts may surmise). All in all, Google’s certainly got its hands full — and it shouldn’t be long before the fruits of its labor start making their way into our lives.